Here's an old school Hot Rod that was just brought to us and is now being offered for sale. 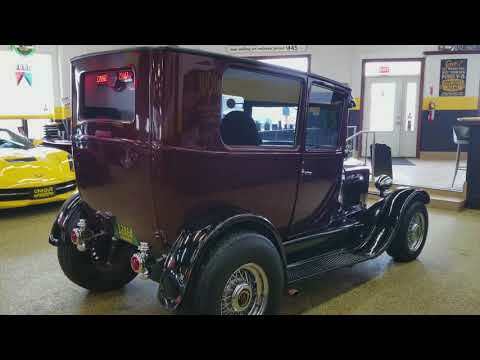 This is a 1927 Ford T, the last year they were produced before the Model A was released. This particular car has remained with the same family for quite some time but the time has now come for them to sell it. It's powered by a Chevy 305 V8 engine paired with a 350 3 speed automatic transmission. The engine is kept cool by a Walker 4 core radiator. It's had a '78 Maverick 8" rear axle installed with 2:73 gears for cruising. The front suspension is a Mustang II with 9 1/2 inch rotors and Mustang brake callipers as well as rack and pinion steering. The steering column does have tilt and is out of a 1966 Chevelle. VDO gauges were installed in the dash, a Ron Francis wiring harness, Lokar shifter, and custom interior complete the interior. Feel free to give us a call at 507-386-1726 or email "sales@unqiuemankato.com" and we'll further assist you with this Model T Hot Rod. OFFERS AND TRADES WILL BE CONSIDERED.....FINANCING IS AVAILABLE!